How to complete the Await the World-Eater exotic quest. Bungie began to introduce exotic quests in Destiny 1, and it was a no-brainer that they would continue this in Destiny 2. 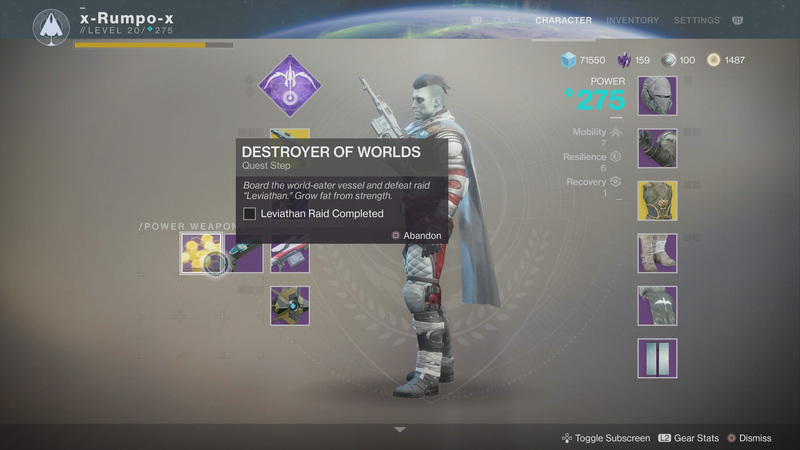 The first such exotic quest appears to be called Await the World Eater, and so far, there isn’t a lot of information to help Guardians complete it. The quest appears to be a random drop, but players have reported getting it after completing a Public Event in the European Dead Zone. It’s also not likely the drop will happen until you have reached Level 20, or possibly have completed the story. You could try farming those Public Events for a bit, but there are no guarantees the quest will drop. Once we know for sure the parameters that cause it to pop, we’ll be sure to update this guide. When the quest drops it will show up in your Power Weapons inventory as a quest step called On the Comms. This will require you to retrieve five Red Legion Communications, which can be done by killing Cabal. You could do this in the European Dead Zone, or you could also fire up the Inverted Spire strike. Both are likely to give you the drops you need, which are random when you dispatch Cabal. The next step in the quest is indeed to complete the Leviathan Raid activity. For this you will need a fireteam of six, all between 260 and 280 Power if you hope to get through what is sure to be the toughest event in the game thus far. You can read our Leviathan Raid guide if you need help to get it done, but we won't be outlining the steps to finish it in this article. Once you complete the Leviathan raid, the next quest step is to End the Arms Dealer. This step has you completing the Strike by that name, but it's accessible from the European Dead Zone map on Earth. Select the Strike, which comes at a recommended Power level of 300. Like a Nightfall Strike, it also has a timer. You can extend the time you have to complete the End the Arms Dealer Strike by shooting the blue Anomaly orbs that appear thougout. Each one you shoot will add 30 seconds to your timer, so do your best not to miss any of them or you're only making life more difficult on yourself. Completing this special version of End the Arms Dealer will result in Guardians getting the Legend of Acrius Exotic Shotgun, and a new item in your Power invetory called Back to the Bazaar. Head back to the Tower and into the basement under where Hawthorne stands where you'll find a maintenance robot called Benedict 99-40. This NPC will sell the Legend of Acrius Exotic Shotgun once you have it unlocked, but that's not why you're here. You want to turn in the Back to the Bazaar item that you got when you completed End the Arms Dealer. In return, Benedict 99-40 will give you a new quest step. This quest step must be completed with the Legend of Acrius Exotic Shotgun, but it can be done anywhere in the Destiny 2 universe that you wish to go. Meet the following criteria. When you have completed these steps, head back to the Tower and into the basement under where Hawthorne stands. Speak to Benedict 99-40 again to progress. The description for this is sending you back into the Leviathan Raid. This time you need to eliminate bosses to gather 100 Emporor Seals. This is the part of the quest we're currently hung up on, but it seems pretty straightforward. Load the Raid and get started. Whether this is the last step or not, we're not sure, but we'll update when we know. While you impatiently await the next steps to the World-Eater quest, consider stopping by our Destiny 2 complete strategy guide. It will help you make your way through story missions and strikes, as well as level up fast and unlock a new Subclass if you so desire.